The growth of Irenberg has been phenomenal and it has been a great many years since we have seen a Kingdom flourish so quickly. Sadly, this has come at a great cost. Aggression has ranked paramount within these lands, competition is fierce and the Kingdom is filled with a large number of elite warriors. Egos are large and these warriors demand respect, at any cost. The three most notable Orders within the Kingdom have begun to establish themselves, these being the Art of Execution, Brutal Brigade and the Irenberg Legion. These three Orders have consumed much of the lands most skilled warriors, but they are far from securing full dominance over the lands. 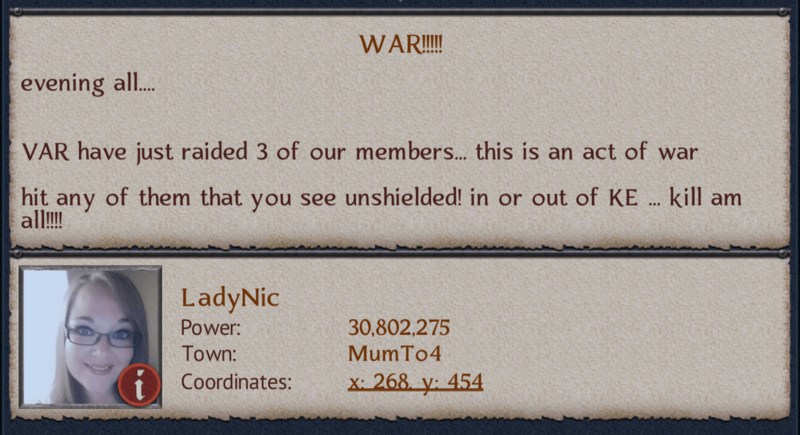 War has been erupting all over the map, with these top three Orders at each other’s throats, plus those lower down the list, resulting in utter chaos and madness. 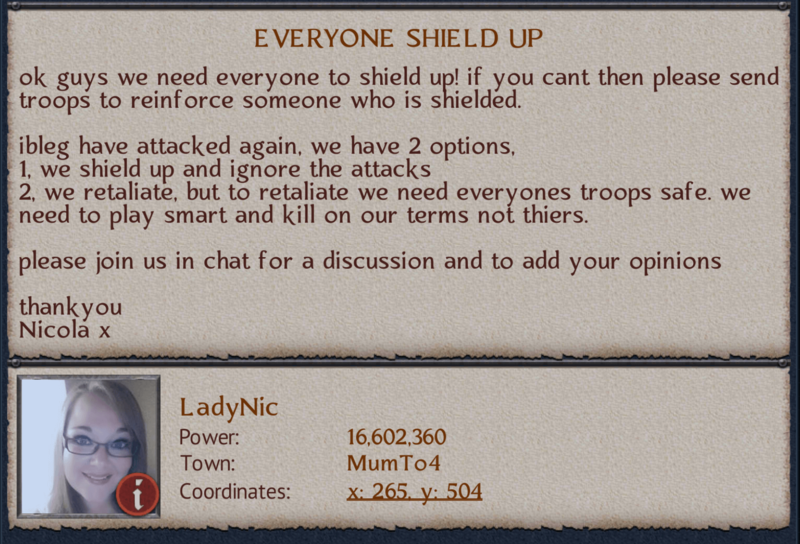 Still, training continues on as Orders attempt to keep their men and women in fighting shape, preparing them for the bloodshed that they are sure to face in these wild times. 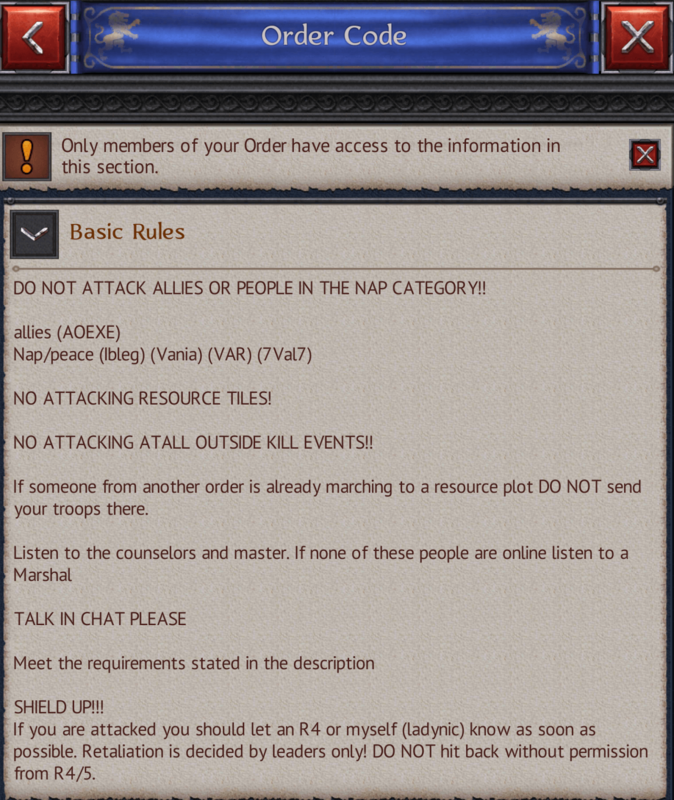 Two Orders that continue onward with their disputes are the Brutal Brigade and Var Orders. Both of them have exacted a heavy toll on each other in recent days. Adding fuel to this already-raging fire, The Brutal Brigade made another powerful enemy, the Irenberg Legion, a formidable foe comparable in strength. Fortunately for the common folk of Irenberg, this all became too much. With every Order at each other’s throats and blood running thick in the streets, the stress began to break the back of this young Kingdom and the people demanded change. Order HAD to be restored, before the Kingdom tore itself apart, piece by piece. 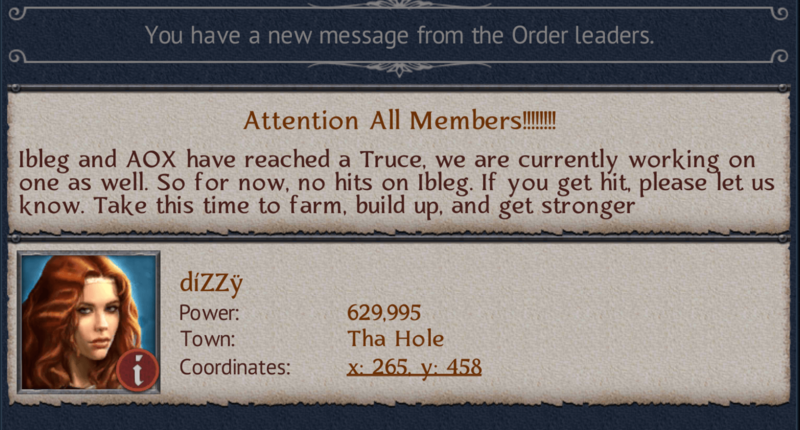 Peace was finally reached among the top ranking Orders, and for at least this moment, things are beginning to return to normal. 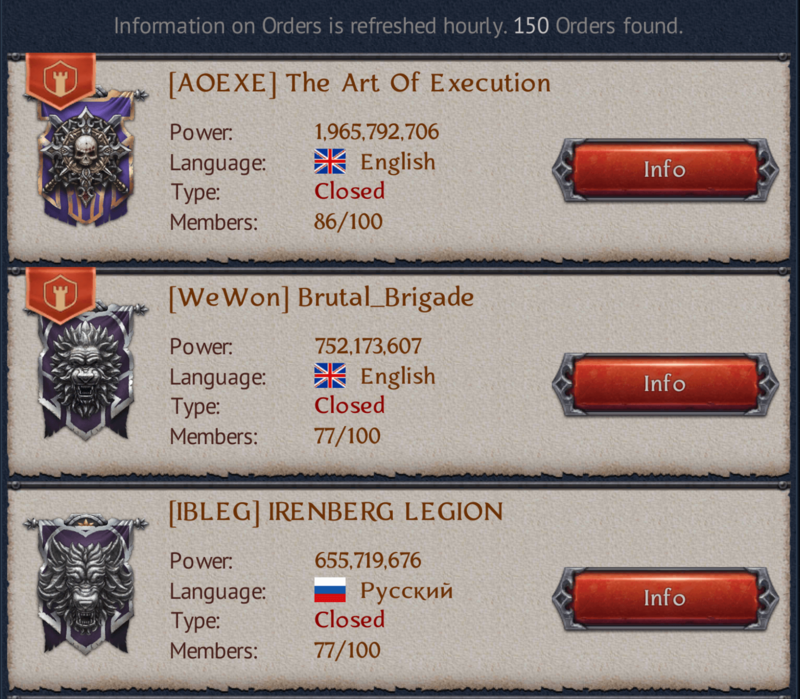 The Art of Execution, Brutal Brigade and Irenberg Legion have all struck a "non-aggression pact," or even better among some, full-blown peace. With so much bad blood and tension, it has been an arduous task for the leadership of these respective Orders. They have had a hard time keeping their rank and file troops away from one another and fights have still erupted from time to time. This has resulted in strict rules being enacted and put in place, rules that if broken, could result in your immediate dismissal from your Order, with no questions asked. 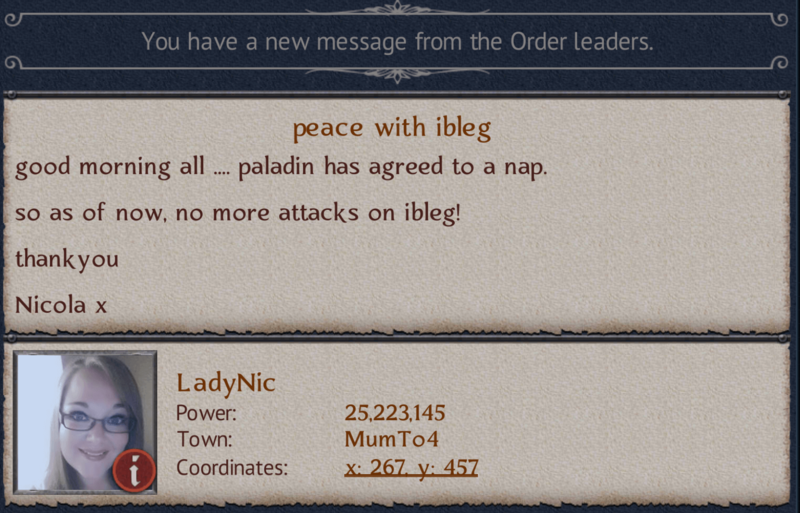 For now, the peace is largely holding and the Kingdom of Irenberg is progressing forward. This is good news indeed for anyone who wishes to call these lands home, for the day is soon coming when the borders are thrown open wide and these new lands are exposed to the wolves that live outside their borders. Order and Kingdom wars are coming and Irenberg would be well-advised to continue down this path, putting aside their differences and focusing on growing their strength, rather than wasting it on each other.